Is it Love? 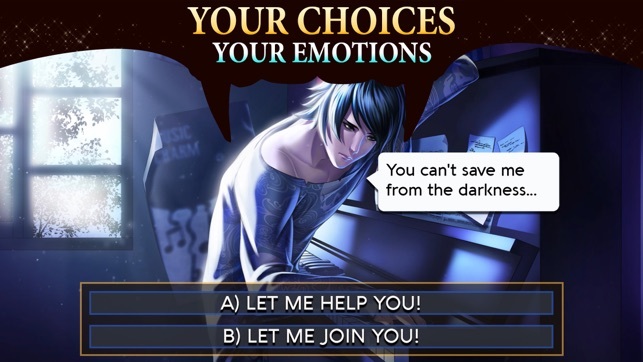 Peter - Vampire is an interactive game (choice game). 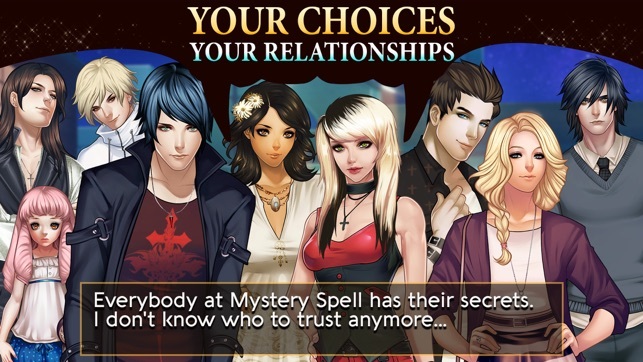 A game with vampires, Witches, and werewolves. Like in TV sitcoms, new episodes (chapters) are regularly released. You can download this interactive love game (choice game) for free. 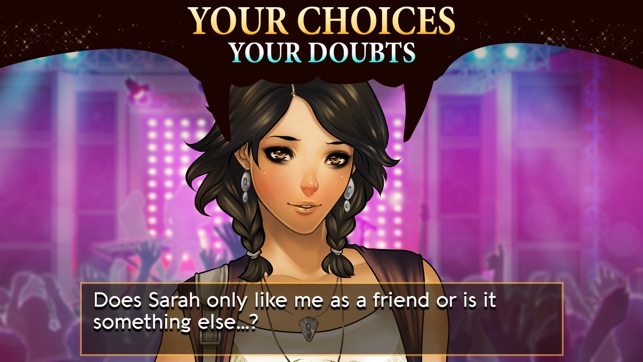 In each episode, you'll have a lot of choices to take in order to make it YOUR story, YOUR romance! However, only one inhabitant is always on your mind and arouses your curiosity, and that is Peter, the most mysterious and most melancholic of the Bartholy brothers. Will you manage to tame him without putting yourself in danger? Will he confide his darkest secrets...? - Meet with Vampires and Witches. 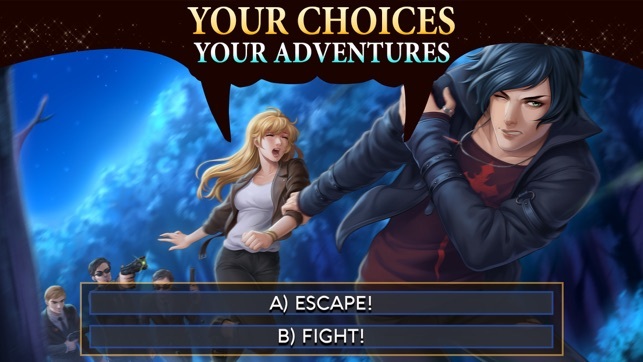 - It's your game: Your choices influence the story. - A new visual adventure. 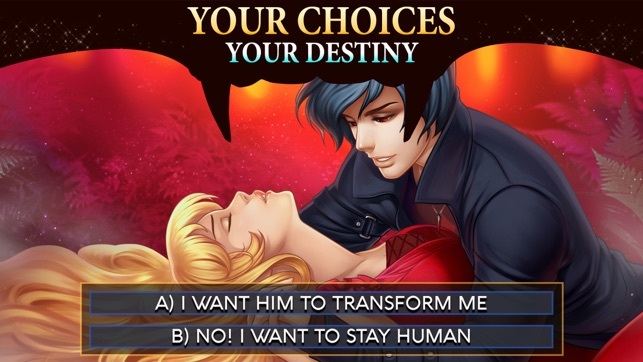 Your choices, your story, your romance! The story is really good! It takes its time building up the relationship and the characters are interesting (same with Drogo’s story so far, though I just started that one last night). I’m still only on the second chapter and really am enjoying the story. However, last night the game glitched out on me and took me back to the beginning of the chapter (I feel like I was nearing the end of chapter two). HUGE setback! This was right after I’d purchased almost $10 worth of energy. So I contacted their support to see if they could help - but no. They said they had no records of me being any further than where I was 😭 I’m so sad that I have to spend several days getting back to where I’d left off (because I’m never spending money on energy again if it’s just going to take be back with no support willing to assist). This was after I’d cited what had happened in the story when I left off and where it took me back to the representative. I get that there must be a lot of people trying to get free energy, but even a refund would have been a nice gesture. Or just enough energy to get me back to where I’d left off (even though I’d still had 1800 energy left when the game glitched). I’d love to read the rest of the story, but I’m not sure I will now. I just started playing not too long ago and I really like the story and the way it works; it addicting! Well it would be if they didn’t make us wait for so long... when I regained my energies I went right to reading the story and tapped my screen as few times as I could, thinking that the reason I ran out of energies so fast was because of how fast I was reading but I still ran out of energies in about 5 minutes!!! And I have to wait another WHOLE DAY just for five minutes? The hell no! And I even played the mini game and watched a video earning 50 energies and I swear I ran out of energies again in under a minute. No joke; I tapped the screen like 4 times!!! If your impatient and can’t handle endless cliffhangers, don’t get this game. It’s too interesting too do this to us! They could at least change the way energies work and let us read more, or shorten the time to an hour or two. But no. I’m considering deleting the app an knowing myself I’m pretty sure I will in a few days out of irritation of how little I get to read. I’ve really enjoyed this game, and I think that it is well made and exciting, but the energy thing is so STUPID! I tap a few times to read the story, and then it says, “You’re out of energy! Want to buy more?” No, I don’t! I really wish you would take this part of the game away, or do something more reasonable about the energy, but other than that, I think the game is perfect, except the energy part, that is. I’m loving the story so far, it’s really exciting! I have come across the mini game, which is awesome because it gives you a bunch of energies. The only thing I don’t like is that they charge you for secret scenes with real money, which is really dumb and unnecessary. I have made the right choices and have lost seven secret scenes because of this. I mean, I know you want to make money, but this is ridiculous. Other than that, this is an amazing game and I highly recommend it.